Each year, Friends of Pritzker sets out to accomplish significant improvements for A.N. Pritzker. Our largest project to date, Play on Pritzker will transform our outdoor play space into a dynamic, safe and attractive facility to benefit all children and families in the community. 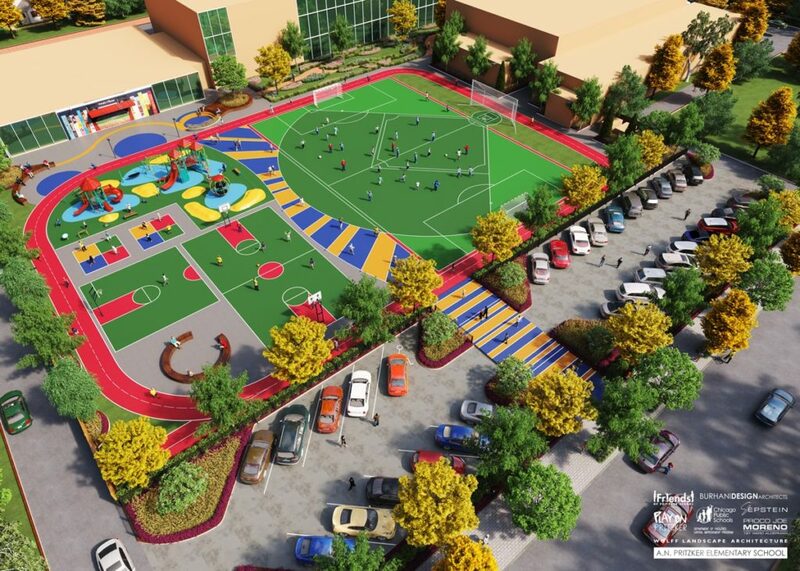 Highlights of the plan include: 61 additional trees and landscaping, new turf field for soccer and kickball, upgraded and expanded play equipment for all ages, 1/8 mile running track, upgraded basketball courts, dropoff land and crosswalk, and additional seating for outdoor classroom space. With pledged financial support from CPS, 1st Ward Alderman Proco Joe Moreno, the Wicker Park community and generous Pritzker Families like YOURS, we plan to break ground in Spring 2019!